After four years of sub-par growth and stuttering reform momentum, Nigerians headed to the polls on February 24. Incumbent President Muhammadu Buhari of the APC party appears to have comfortably kept his seat, after fighting off a challenge from the PDP party candidate and former Vice President Aitiku Abubakar. While an opposition challenge to the result looks likely, we think its chances of success are relatively slim. With a more positive backdrop, in sharp contrast to Buhari’s troubled first term in office, what next for Nigeria? Investors should expect a greater focus on growth and looser monetary policy over Buhari’s second term, which will have important implications for how the central bank chooses to manage the exchange rate if oil prices remain depressed. A collapse in oil price and ensuing economic crisis, which was handled poorly and deterred investment. The resurgence of militants in the north and economic freedom fighters in the south, encouraged by economic weakness. This is the most significant factor as the precipitous decline in oil prices during 2015 placed significant stress on the Nigerian economy which played out in a severely weak banking sector, emergence of dollar backlogs and unorthodox monetary policies which remain with us to this day. The stress was exacerbated by slow and poor decision making which made it tough for an oil economy like Nigeria to attract private capital or generate any kind of domestic led growth as it took almost two years for policymakers to allow the naira to adjust to the realities of the market. When it finally happened the devaluation of the currency also resulted in a sustained period of high inflation and high interest rates which have further dented domestic confidence. These weak economic conditions created an environment within which Islamic militants in the north (Boko Haram) and economic freedom fighters in the oil producing south (Niger Delta Avengers) each used the weak economic conditions to push their agenda. In the case of the Nigeria Delta Avengers this played out through attacks on oil infrastructure severely denting oil production, while Boko Haram activities caused significant disruption in food production in the North and attracted global attention to Nigeria’s security concerns with the abduction of the Chibok schoolgirls. As if these problems were not significant enough, Nigeria faced several periods without Buhari in the country as he spent extended periods out of the country due to poor health. This served to further slow the pace of decision making and policymaking. Although issues regarding Buhari’s health and security remain, he has recently begun to normalise the economy as the clearance of dollar demand backlogs allowed growth to creep out of recessionary territory in 2018. Against this more stable economic backdrop and beyond Bahari’s continued focus on security issues and anti-corruption, we expect to see policy increasingly geared towards improving growth. The need for higher growth is made more pressing by Nigeria’s weak level of GDP per capita. Given four years of negative growth in this and the population growth rate expected to continue rising, this issue will increase social pressures if it is not addressed. The government’s impetus on promoting growth prospects will largely come from implementation of the Economic Growth and Recovery Plan (ECRGP). Buhari has increasingly outsourced economic matters to his more economically minded Vice President Yemi Osinbajo. We now expect Nigeria to make progress on the implementation of the Nigeria Economic Growth and Recovery Plan Act which was created under the guidance of the Vice President. This plan is ambitious and wide ranging but will be crucial if Nigeria wants to attract capital into the country. Focus areas include oil and gas, electricity and agriculture, with reforms desperately needed to address exiting imbalances. A shift in monetary policy? The focus on growth will also impact monetary policy decision-making, especially as unconventional monetary policy remains a constraint on investment and private sector lending. Although the central bank is an independent institution focused on price stability, we expect the consideration of growth to increasingly come into focus driven by the following unrelated factors. Central bank governor Godwin Emefiele’s term comes up for renewal in June. The fact that no central bank governor of Nigeria has served for more than one term since the end of military rule in 1999 means Emefiele’s survival could depend on his willingness to recognise the negative growth costs of unconventional and increasingly tight monetary policy. A move to lower rates by the central bank would also be supported by a planned revision of the inflation basket in Nigeria away from food, which currently accounts 40% of basket, towards items such as telecoms which have increased as part of the general consumer basket over the last five years. We understand the Nigeria Bureau of Statistics has been working on this with the IMF for the past two years and would not be surprised to see the change over the next few years. 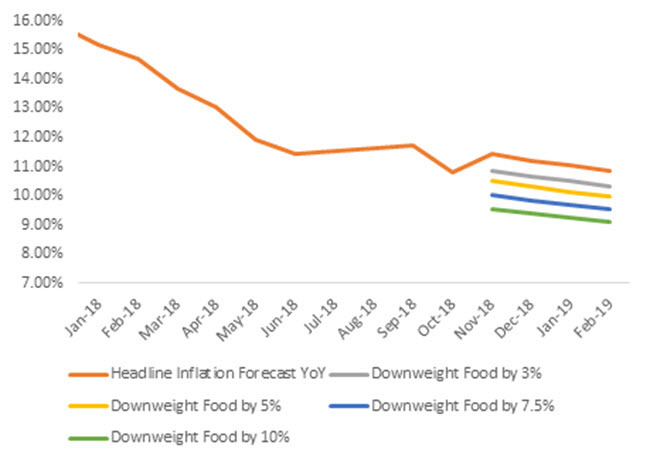 This could reduce inflation by almost 2% depending on extent of the basket adjustment away from food (see Fig.1 below). Source: Haver Analytics, IAM Calculations. 28 February 2019. What are the implications for Nigerian assets? The initial market reaction has been relatively positive as the tail risk of a tightly contested election and possible unrest have largely been mitigated, resulting in Treasury bill and bond yields falling below their previous 1-year tights. The naira need to deal with pressure from lower interest rates, increased fiscal spending as well as the risk of oil prices remaining around the $60 mark. 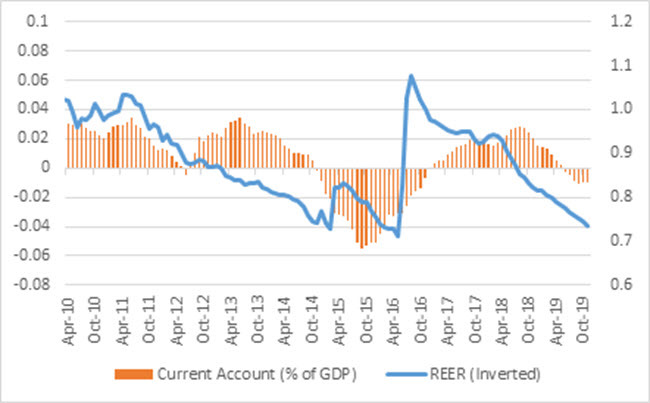 With oil at $65, any spike in imports above $3.5 billion per month level (the monthly average over the last 12 months has been $3 billion) would mean Nigeria’s current account running close to balance and eventually moving back into deficit (see Fig.2 below). Given that most growth in Nigeria (outside of agriculture) is import intensive, we will struggle to see a strong recovery in growth without an offsetting deterioration in trade balance. Although the naira remains stable for now, investors can expect the currency to start to depreciate as the economy gains traction and short rates move lower. We expect to see the normalisation of the Nigeria curve, where we are still close to record levels of inversion when looking at 1-year vs longer dated bonds; 10-year bonds are trading at 13.75% while 1-year Treasury-bills are trading at 17.0%. This should happen gradually and with the government looking to increase local issuance post-election we expect the curve to steepen back to 2018 levels. While we expect a duration trade to become attractive eventually in Nigeria, we expect increased domestic issuance to keep the longer end of the curve elevated in the short term. Source: Haver Analytics, Bloomberg, IAM Calculations. 28 February 2019. Left hand axis: current account. Right hand axis: REER. We are positioned in some of our strategies in a hedged Treasury-bill trade as this allows us to earn 7% carry for our investors without taking currency risk and has us positioned for an expected pricing in of a weaker Nigeria current account balance as the focus shifts towards growth. Additionally, in our view, although we see the value in duration based on monetary policy easing expectations, the short-end of the curve still provides the best risk/return profile given that we expect issuance to significantly shift away from short dated instruments towards longer dated bonds, which should provide more attractive entry levels. This material is for informational purposes only and should not be construed as an offer, or solicitation of an offer, to buy or sell securities. All of the views expressed about the markets, securities or companies reflect the personal views of the individual fund manager (or team) named. While opinions stated are honestly held, they are not guarantees and should not be relied on. Investec Asset Management in the normal course of its activities as an international investment manager may already hold or intend to purchase or sell the stocks mentioned on behalf of its clients. The information or opinions provided should not be taken as specific advice on the merits of any investment decision. This content may contain statements about expected or anticipated future events and financial results that are forward-looking in nature and, as a result, are subject to certain risks and uncertainties, such as general economic, market and business conditions, new legislation and regulatory actions, competitive and general economic factors and conditions and the occurrence of unexpected events. Actual results may differ materially from those stated herein. All rights reserved. Issued by Investec Asset Management, issued March 2019.